Mid- Michigan Snow Equipment is one of the oldest BOSS Distributors and recently celebrated their 30 year anniversary as a successful business. Byron and his brother Ted Russell began their business as lawn and snow contractors that later became a snow removal distributing business following a snowmobiling trip. While Ted Russell was on the trip, he met a BOSS Sales Representative. He quickly became intrigued by the BOSS Multi-position Plow concept and shared the enthusiasm with his brother. Before long, they ordered their first order of six BOSS Snowplows in late March. As snow contractors at the time, they purchased two plows for themselves and tried them out on their own trucks. Impressed by the design and quality of the plows, they soon became a BOSS Distributor. Mid-Michigan prides itself on being a family run business. It started as a business run by Byron and his brother Ted. After his brother’s passing, Byron and his nephew Tim Russell continued to grow the business into what it is today. 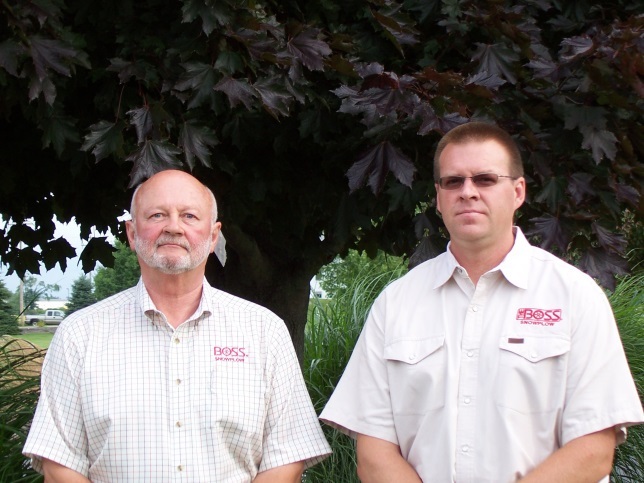 Mid-Michigan Snow Equipment primarily works with dealers in their area who share the same level of enthusiasm and loyalty to quality BOSS products. Byron explains, “No one has the reputation BOSS does. Their reliability and innovation is top notch. BOSS is our business; we do not carry any other brands.” Byron also loves the loyalty of his customers and dealers. “They have continued to be loyal to us, which in turn means they are loyal to BOSS products,” Byron said. If you are a BOSS Distributor and would like to be featured on our "Like a BOSS" blog stream, submit the form and you will be contacted to share your story!